Whether aware of it or not, Ujitso’s home office is a wonderful, minimalist homage to either Piet Mondrian and/or Roger Black. 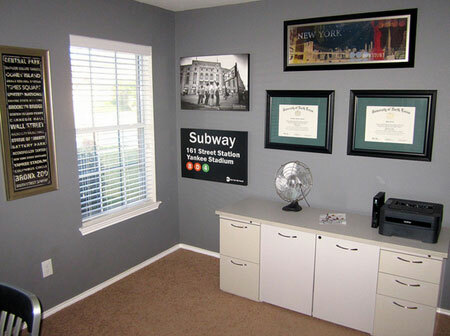 The simple color palette reduces visual distractions and also creates a calm environment for doing work. The shelves are a nice way to take advantage of vertical space for storage. 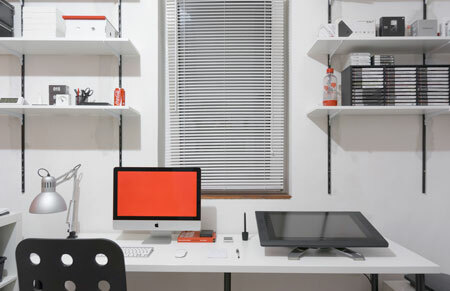 And, the cable control with the black strip hiding them down the wall (look toward the middle of the desk) is amazing. 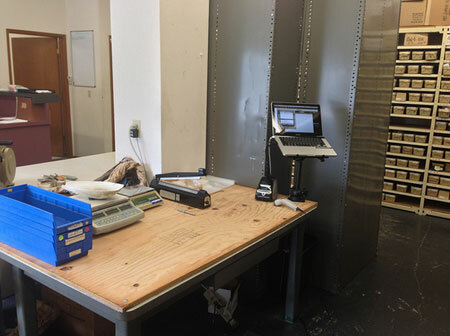 Thank you, Ujitso, for sharing your workspace with us. There isn’t much I can say that the images don’t convey themselves. My only other comment would be that I really like to see useful spaces where people understand their needs and design their homes to meet those needs. This is a truly wonderful, vibrant space. Thank you, Little Luck Tree for your submission. 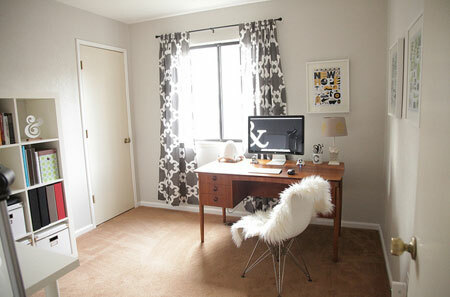 More details about the room can be found on her site at http://littlelucktree.blogspot.com/2013/09/his-hers-office-space.html. There are so many things I love about this office setup that I am downright giddy. I’ll start with the Macbook Pro mounted to be standing height, which is genius. Workers in this space are on their feet when they’re working. I’m assuming they use the computer to mark orders as received, filled, and shipped, so it makes sense for the computer to be located next to where they are working but in a way that is suitable for their workflow. Secondly, the mount brings the computer up off the table that is used for wrapping, so it won’t easily get damaged or lost in packing materials. A really terrific idea. Third, and what made my heart swoon, are the shelves and shelves of well labeled and stored supplies in the back right section of the office photograph. There is a place for everything, and everything is in its place. When an order comes in, the people who work here know exactly where to find the items to fill the order. Thank you, My_OCD, you and Spencer Aircraft are doing things beautifully. We truly appreciate you sharing your images with us. Dion’s new office setup is relaxing, expansive, and perfectly suited for his needs. 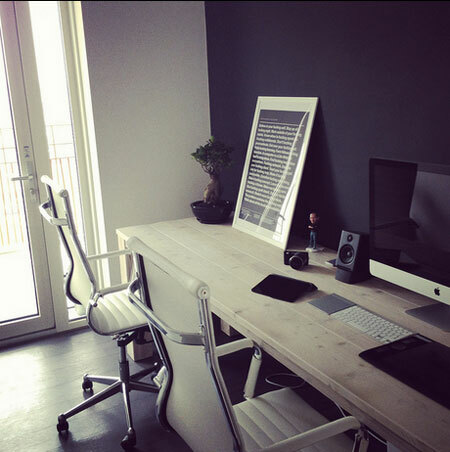 The light colored wood against the dark wall gives the office a sleek, modern feel. The dark wall also makes it easier to focus on the monitor by offering no distractions and a clear view of the content on the screen. The side-by-side chairs allow for two workers to collaborate or one user to have a nice area to spread out during the midst of a work day. I also like the wireless keyboard and wireless trackpad, which reduce the number of cables on the desk and allow for greater flexibility in placement. Thank you, Dion, for sharing your office space with us. This is where an ESL lecturer gets stuff done at home, away from the hectic classroom and the distractions of a shared office at the Uni. I was inspired by photos of Dieter Rams home workspace and needed extra surface area for occasional co-working with my better-half. The Melltorp table is Ikea’s best lesser-known desk option. Add a flipped-over Pluggis for a monitor stand and a few candlesticks for the speakers. I also have a phobia for visible wires. 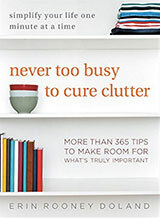 I love how white is the base color, which helps a great deal with keeping distractions to a minimum. A single color of any kind could have the same effect. I also love the cable control in this office — so many items are wireless, and those with wires have them culled with hooks on the back lip of the table. The speaker stands are ingenious. There are so many things to be inspired by in this office; thank you, PennPal, for sharing your space with us. 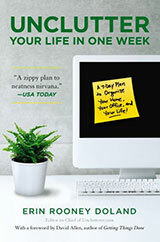 In theory, when you telecommute for work you can do so from anywhere. I imagine working from my bed or even on my living room couch. NomadJim imagines places much more glamorous and telecommutes from workspaces with amazing and inspiring views in warm climates. 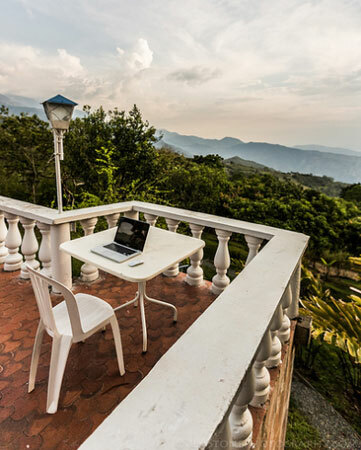 This terrace that he has commandeered as his workspace is in San Jeronimo, Antioquia, Colombia. This isn’t the first time we’ve featured NomadJim on Unclutterer. 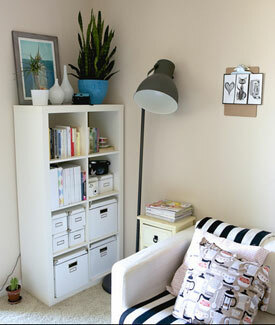 In 2010, we showcased his outdoor tropical retreat office. Then, in 2012, we highlighted his actual corporate office space. His corporate space was terrific, but this view and climate are even more desirable. Such a perfect place to set up a laptop and get some work done. Thank you, NomadJim, for sharing your inspiring location with us. Minimalist PC ‘desk’, utilizing the small space I have. What more do you need? 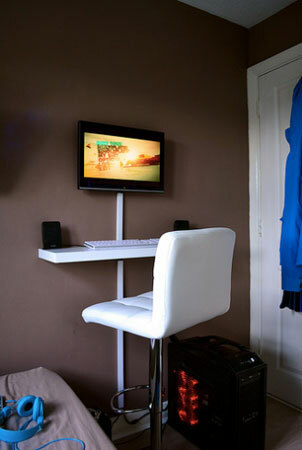 Wall mounted monitor, floating shelf, leather gas lift chair, and some cable management. I think the chair makes the space because it’s stylish and looks great next to the dark wall color. 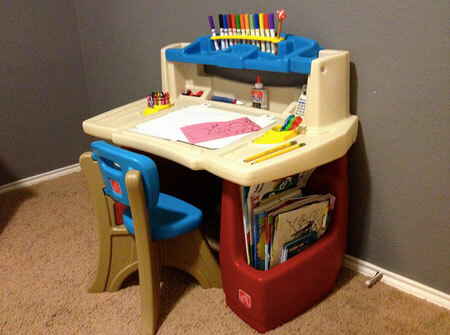 Since the height adjusts, it can be used for different purposes beyond just working at the desk. 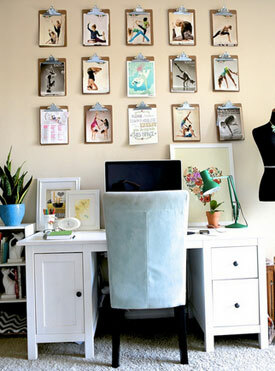 I also like that the desk was hung at standing height to offer an alternative working position. And, I’d be remiss if I didn’t mention that amazing cable management — wow! 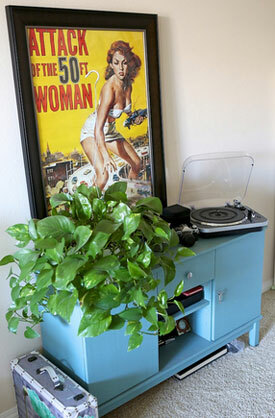 It’s fun and non-traditional, and I like how creative and practical it is for its owner. Thank you, Ross, for sharing your workspace with us.